So… what exactly do you take when you go on a trip with no end in sight? Great question. Months leading up to this consisted of research on what I should take, and not where I was going. Disclosure… I’m an organized freak. So, a look at what is inside my pack. 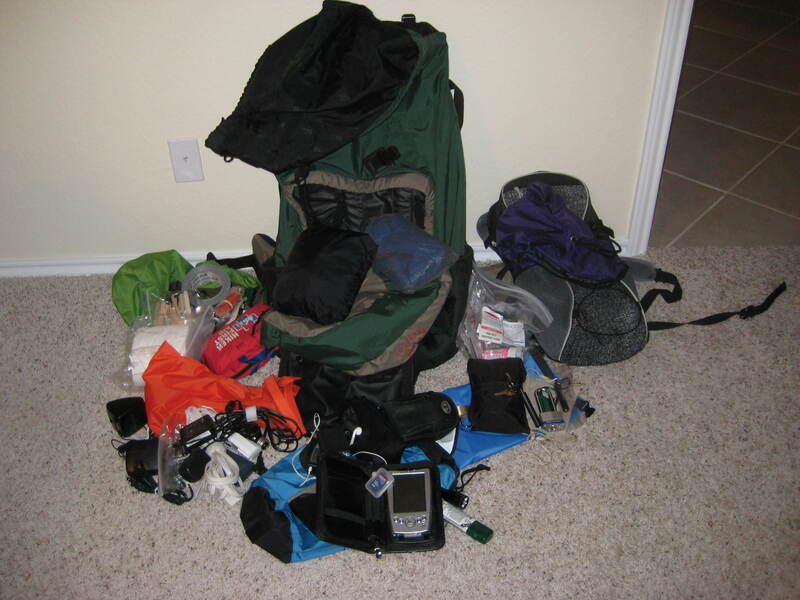 To start off with, I am taking one large backpack, a small day pack, and then a ultra light stuff sack that will mostly be used for the beach. My day pack will be used to carry anything of importance when I’m transitioning between towns and also for any day hikes that I will partake in. Although not pictured… I decided to splurge and take clothing… I know… shocking. Trying to keep it pretty basic, but consists of the following: 2 pairs of shorts, two swim suits, jeans, kakhis, 3 button shirts (which I will wear 95% of the time), 3 t shirts, 1 cut off shirt, soccer shorts, 1 polo, 1 dress shirt, socks, fleece, and a light under armor shirt (so liight, and if I ever get cold, it can do wonders). I think I’ll take a couple pairs of boxers also, but currently, that just sounds like to much work. So, looking at it, it’s kind of interesting to think that I’m only taking about 5 days worth of clothes for a 160 day trip… let’s see how that works out. 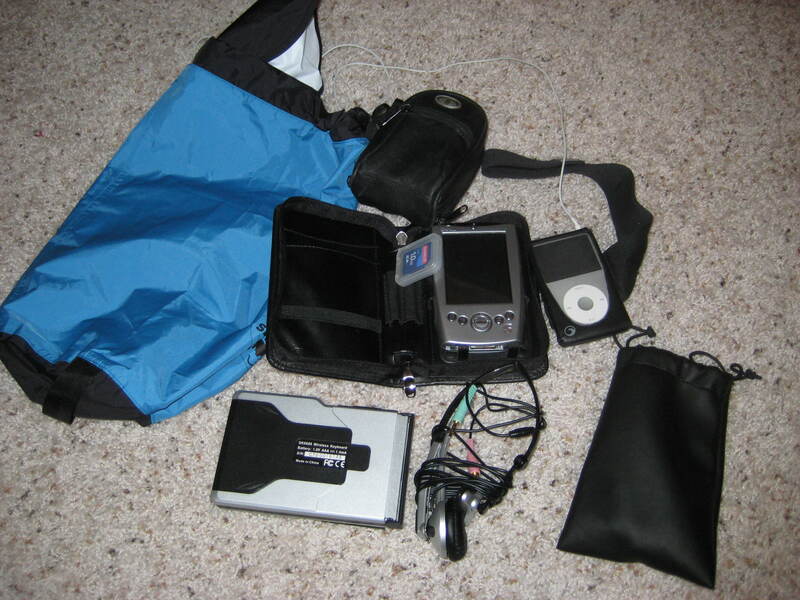 For my basic electronics, I’m taking a pda and collapseable keyboard (which is what I will be doing all my writings through), iPod, skype headset to call mommy and daddy and inform them I’m still treking, Canon SD 1000 camera (which I would highly recommend for a light weight camera, takes great pictures), and a collection of memory cards and sticks to hold various data (not pictured). All of this is kept in a blue dry sack. So, note to people who might rob me… go blue. In a red dry sack, I keep all of my electrical accessories. 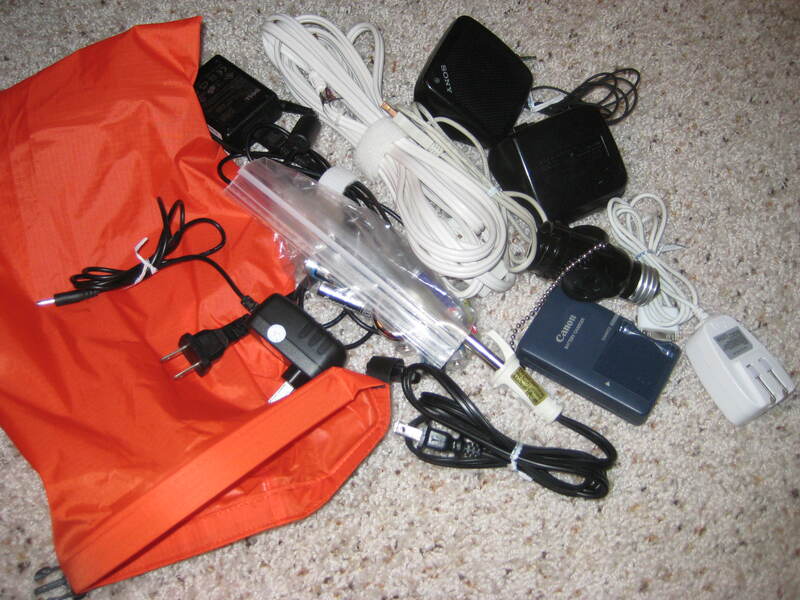 This consi sts of the following: camera battery charger, iPod charger, memory card reader, crappy speakers that barely project, nifty little gadget that turns a light socket into an electrical outlet, immersion heater, extension cord, various battery sizes, and an extra usb cable. In a green stuff sack is odds and ends that will come in handy every now and then. 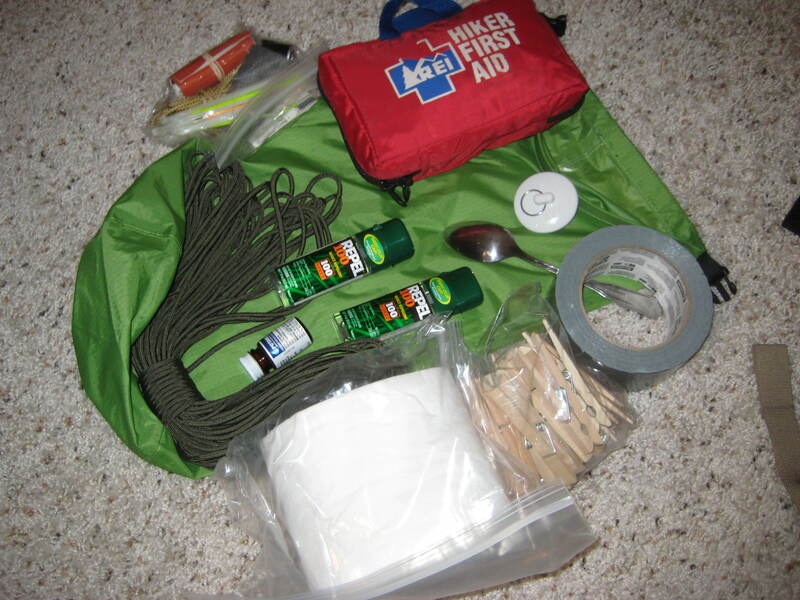 We have the First Aid kit, a role of duct tape (never leave home without it! ), drain stopper, iodine tablets to purify water if necessary, bug replant, cord, clothes pins (to dry cloths on a line), and a repair kit. 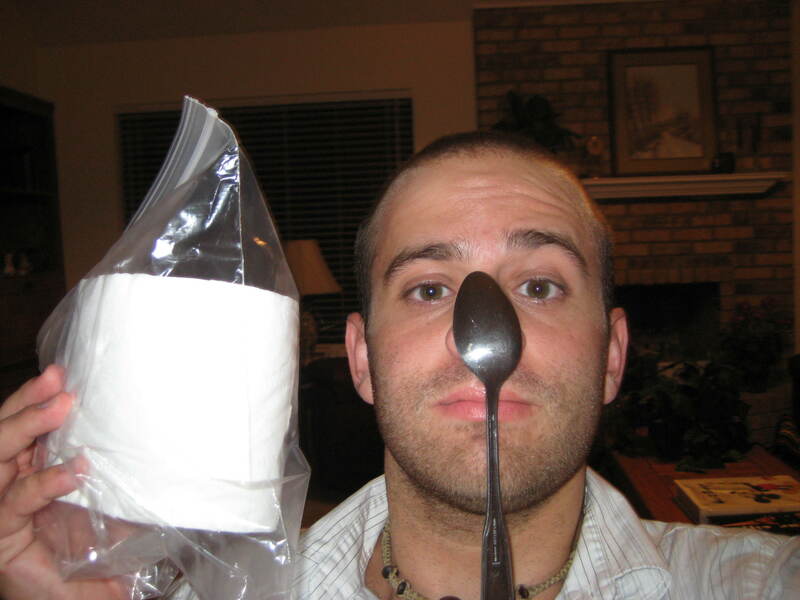 Two of the most important items… a spoon and toilet paper. I managed to steal the spoon from my mom’s cabinet the other day (sorry mom), and I’m sure it will allow me to have numerous spoon hanging contests on my nose. That’s an easy game to pick up when there is a language barrier… and plus, I’m awesome at that game and I promise you that I will win every time. And for toilet paper… well, that’s a given. Went to the store earlier and picked up a variety of medicines. Seriously, I have so much I think I can cure someone if their arm feel off (exaggerating just slightly). I decided to take malaria pills… I’ll keep everyone updated on adverse side effects. For security, I have a Pac Safe locking mechanism to keep my pack safe, an assortment of locks, and a money sling that I’m sure I will never use. My pack will be chained up at all times, allowing me to keep any valuables stationary. So far, most of this takes up close to no room (maybe twenty pound s, give or take) …. but now let’s get to the books. This is the bad part. 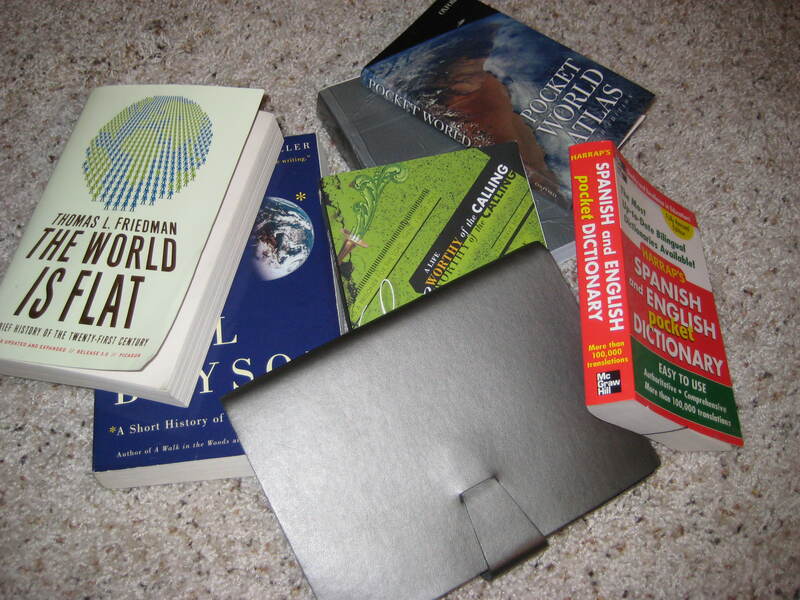 As of now, starting off with a journal to make random notes in (mostly just to play tick tack toe), Spanish to English dictionary, World Atlas (I already consider myself one hell of a geographer), Urbana Study Bible, 2 books to start off reading for pleasure (which I’ll trade out), and Lonely Planet’s Central America on a Shoestring (one of the best guidebooks ever written). Obviously, things will rotate in and out as I travel, so when I get back, it’ll be interesting to note the changes. For those doing a trip like this anytime soon… hope this helped give you an idea on what to bring. Looks like your well prepared. May God go with you as you explore his wonderful world. Good Luck Eric! Can’t wait to read up about your adventures! I cant beileve you brought those speakers… i think you have seriously had them for 10 years now.